​​​​ALLEN – Construction of Allen’s newest community park is expected to begin May 2017. 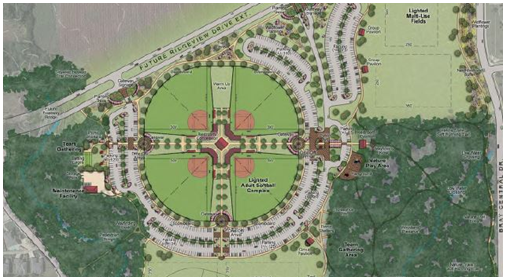 Located at the southwest corner of Ridgeview Dr. and Bray Central Dr., it will feature a lighted softball complex with artificial turf, multi-use fields, a looped pedestrian trail, nature trails and a playground. A central restroom facility and concession stand will make the new park an attractive option for large tournaments. 25 acres of the park will be kept as natural land. The park will cost approximately $10 million, including $7.3 million for construction. Additional funds will cover the installation of artificial turf and public art. ​Want more data? See DFW Overview Market Research.